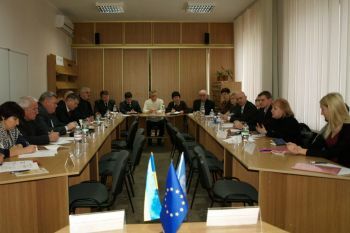 On November 26 a launching seminar for three Chernihiv rayons – Semenivsky, Sosnytsky and Nizhensky – took place in Oblast Council. These rayons were selected for piloting in CBA Project with accordance to a Ukrainina Law “About cooperation of territorial communities”. Piloting will be implemented under Council of Europe and Ministry of regional development support. 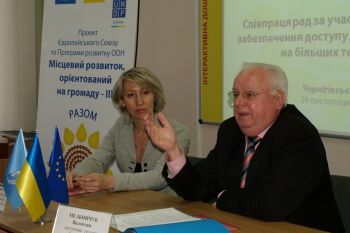 Among distinguished attendees of the seminar were Deputy head of Chernihiv oblast council Valentyn Melnychuk, Senior programme manager of UNDP in Ukraine Oksana Remiga, CBA International project manager Jaysingh Sah, CBA Community development specialist Olena Ruditch, representatives of local self-governance of these rayons. In his welcoming speech, Deputy head of oblast council Valentyn Melnychuk stressed that CBA Project activities are very important as they mobilize communities to implement local initiatives. “Self-organisation of community members which jointly with local authorities address local community issues is very important also because Chernihiv region is a piloting oblast for implementation of the self-governing reform”, underlined Mr. Melnychuk. Senior programme manager Oksana Remiga presented the Third phase of the CBA Projetc to the participants of the seminar. Among the main objectives of CBA Project during the Third phase remains promotion sustainable local social and economic development through strengthening of participatory governance and mobilization of local communities. Participants of the seminar learned about terms and conditions of cooperation with CBA Project during the Third phase, especially about piloting and co-financing specific. Also legal and managerial aspects were discussed during the meeting. Summarising the results of the discussion it was decided to create a Working group with participation of piloting rayons’ officials for further discussion of the piloting specifics.